I have not seen GHOST RIDER: SPIRIT OF VENGEANCE. But I had a blast at CRANK. I love LUTHER so Idris Elba’s presence pleases me and it’s no secret I adore Nic Cage and would happily punch heads on his behalf. BUT… for about twelve minutes, Patrick and I thought we might actually get the chance to make GHOST RIDER 2. I’ve written similar entries in the past. You can find a screenplay that birthed both MESSENGERS and MESSENGERS 2: THE SCARECROW. There’s also a post explaining how Mark Haslett and I were attached to COWBOYS AND ALIENS for about three minutes. And then my and Patrick’s pitching the FRIGHT NIGHT remake at two different companies. Since they are the most recent three entries in the Essay section I won’t bother linking. So let’s talk GHOST RIDER 2. 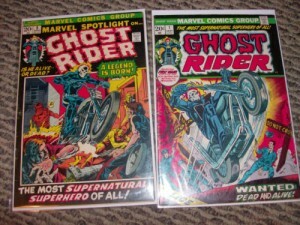 First off, I still have my Ghost Rider #1 and my Marvel spotlight #5. 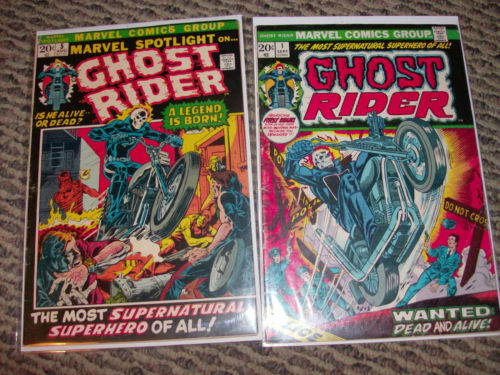 I always LOVED Ghost Rider because he wasn’t squeaky clean. Ghost Rider was supposed to torment the innocent but chose to use his powers to punish evil. 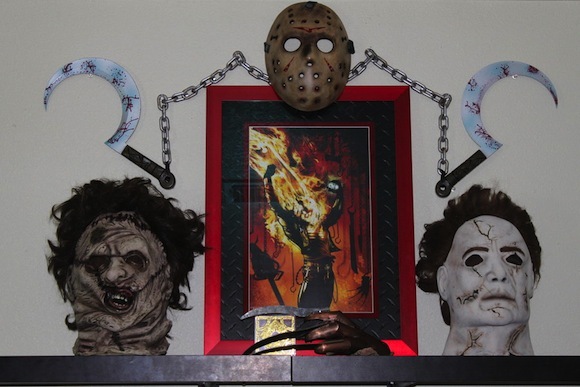 And his head caught on fire. Here’s the quick and dirty version to catch you up. Patrick and I wrote DRIVE ANGRY. Our agents sent it to producers. We met with those who responded favorably. The moment we met with Mike De Luca, we never met with another. Patrick and I were in manlove. Then we sent DRIVE ANGRY to studios. MOST everyone reacted with excitement. Even the passes were favorable. Except the company that brought you DIE HARD and LETHAL WEAPON said it was too violent. It should be noted that the economy was not good at the time. Studios weren’t making the movies they used to make. In fact, one Studio Head told us “When we were making 40 films a year this would be a no brainer but now that we’re making less than ten…” Although we had interest De Luca decided to send the screenplay to Nic, who responded the same day. He loved it. Once Nic was attached the falcon finally hit lightspeed. Deals were made, locations discussed… it was happening. During one of our many meetings, De Luca, who had produced Ghost Rider, suggested we come up with a pitch for Ghost Rider 2. We said yes with much enthusiasm. So Mike set a meeting with Avi Arad that we might meet and discuss the franchise. And we had a blast. We met Avi and his son Ari (who sat with me and Tom Jane during the My Bloody Valentine premiere). We talked superheroes and what made Ghost Rider different. We talked through what Vilains we could legally draw from. It was a perfect meeting.